INDEVA Lean System® is ideal for creating modular gravity fed flow racks for different applications. 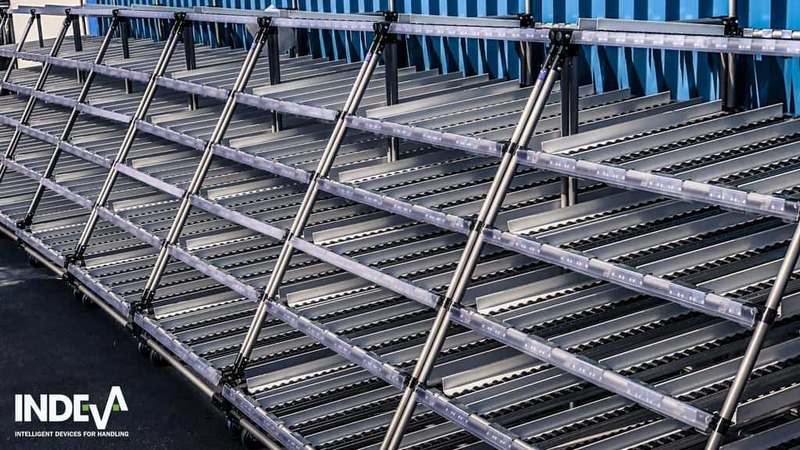 Using modular flow racks increases your production workflow efficiency, improves picking efficiency, provides ergonomic pick-face replenishment as the inventory is always at the front and reduces production costs, so achieving a Lean Manufacturing flow. A great variety of custom configurations are possible for gravity fed flow racks made with INDEVA Lean System®; you can design and build your flow rack easily and quickly, and you can reuse same components to create a different structure when new production needs arise. Customization – you can design your flow rack to perfectly suit your inventory and functional requirements, and optimize ergonomics, footprint, etc..
Adaptability – as all structures made with INDEVA Lean System® can be n easily and quickly modified as new inventory is introduced. Modularity – modular flow racks can easily be integrated with other INDEVA Lean System® modular structures such as work stations, work in process carts, etc..
Mobility – flow racks can be equipped with our casters and be easily moved where needed. ESD Compatibility – they can be built using INDEVA Lean System® ESD compatible pipes and accessories.